As part of a regular feature, The Electronic Intifada reports on the latest developments of the Palestinian-led global boycott, divestment and sanctions (BDS) movement against Israeli violations of human rights and policies of apartheid. BDS campaigners scored a significant victory this month as the London Borough of Tower Hamlets voted to exclude Veolia, a French firm that has provided services to the Israeli occupation in the West Bank, from receiving any contracts with the municipality. Activists have also staged protests and launched campaigns in Ireland, Belgium, Palestine. The day after the American pop star Macy Gray announced controversial plans to perform in Tel Aviv in March, we sat down for a drink at Pua, a bar nestled in the heart of one of Jaffa’s most gentrified neighborhoods. 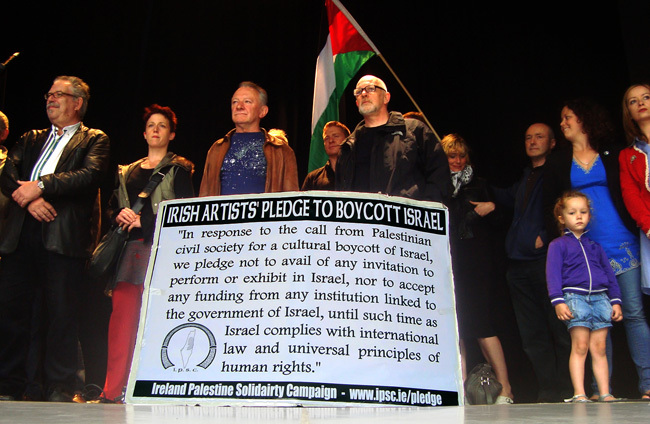 Irish singer-songwriter Dylan Walshe became the landmark 200th signatory to the “Irish Artists’ Pledge to Boycott Israel”, which commits endorsers to not “avail of any invitation to perform or exhibit in Israel, nor to accept any funding from any institution linked to the government of Israel, until such time as Israel complies with international law and universal principles of human rights”. The failure of Israeli tennis player Shahar Peer to appear at the ASB tennis classic in Auckland, New Zealand, this week is a significant victory for the BDS (Boycott Divestment and Sanctions) campaign against apartheid Israel. Despite being the subject of protest in 2009 and 2010 Peer was adamant she would to return to Auckland. She told media last year she was keen to come back.